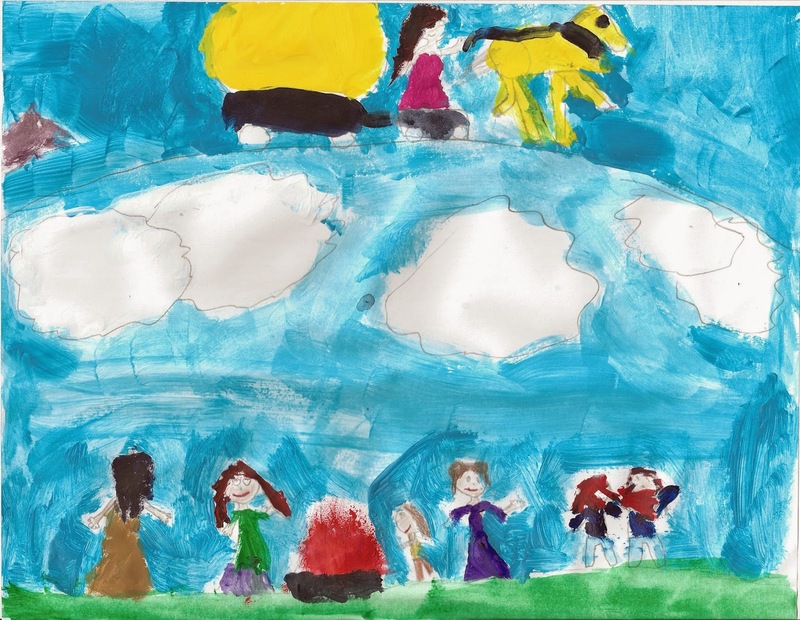 We received many wonderful works of art in the kids’ division of this year's Midsummer Art Contest. 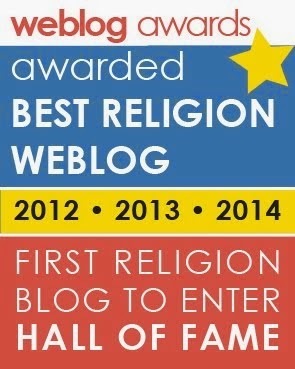 So many pieces were so good that – for the first time in three contests – we have a three-way tie for third place! The winners are determined by adding together the scores of all three judges, and the total scores were exactly the same for our trio of bronze medalists. You may have noticed that the announcement of winners has arrived a day later than planned. Joanne Harris and I had already finished ranking the entries, but Joris van Gelre was experiencing technical difficulties viewing that entries that we were, in the end, unable to resolve. Our friend Kári Pálsson heroically stepped in as the third judge yesterday and added his scores to ours. 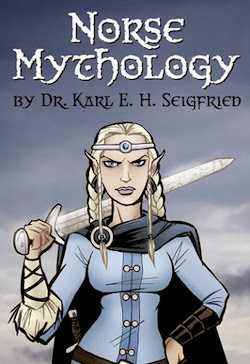 Kári is an Icelander who serves on the lögretta (very roughly translated as “board of directors”) of the Ásatrúarfélagið (“Æsir Faith Fellowship”), Iceland’s organization for those who practice Ásatrú, the modern version of the ancient religion of Odin, Thor, Freya and the other Norse gods and goddesses. He is very passionate and knowledgeable about the Old Norse myths and poems, and I am always glad for his input. Special thanks to both Joanne and Kári for their work as judges. It is much appreciated! Congratulations to our five winners! The assignment was to create a piece that was on the theme of midsummer and contained at least one element from Norse mythology. Judging was based not purely on technical ability; creativity and connection to mythology were upmost in the minds of the judges. These young artists impressed all three of us, and I hope that they continue to explore the rich tradition of the Norse myths and to create new works of original art. Three of the five winners have been students of Cathy Yeoman in Victoria, Australia. Her students made a clean sweep of the kids category in the Midsummer 2013 contest, and they took two of the top spots in the Midwinter 2013 contest. 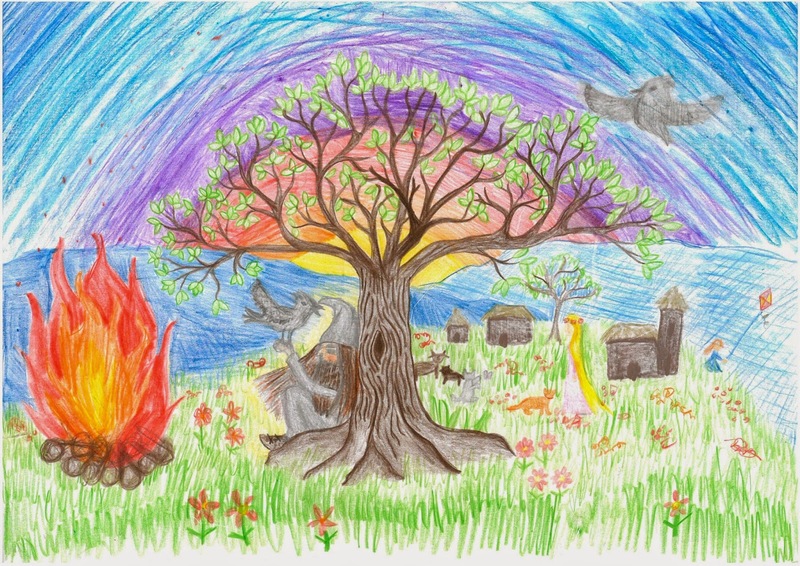 Cathy teaches Norse mythology to her Class 4 students, and the results are very impressive. I would like to again thank her for her work in keeping the myths alive. We need more teachers like her around the world! Sheoaka describes her picture: "Odin is sitting on the sweet grass with his raven, Hugin, resting on his hand. Freya is walking her cats. The bonfire is ablaze, ready for the midsummer celebrations." This piece has such a strong composition and so wonderfully integrates several elements from the myths. Sheoaka won first place in the Midsummer 2013 contest, and her work continues to mature and inspire. We all hope to see more from her in the future! 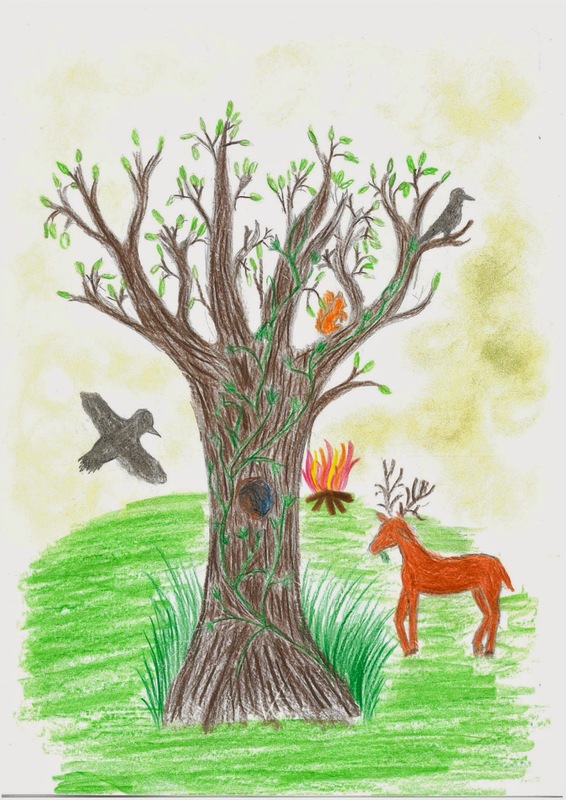 Rani writes, "In my picture I drew an ash tree with Hugin and Munin (Odin’s ravens) flying around it, Ratatösk the squirrel jumping about, and a deer nibbling at the grass. Hugin and Munin have come to tell everyone that the midsummer festival is beginning in Midgard." Rani won first place in the Midwinter 2013 contest, and this new artwork again shows a creative mind and a wonderful spirit. She has created a piece that is both beautiful and instantly classic. Emma sets the scene: "It is Midsummer’s Eve, and Freya and Frey are walking along the beach in search of a spot for their picnic. In the background there is the cat-drawn carriage and the smoke billowing up from in the depths of the valleys. That is where the bonfires are. There is also Iduna’s golden apple tree, the apples of which keep the gods young." Emma won third place in the Midsummer 2013 contest with a whimsical picture of dwarves gathered around a Midsummer Eve fire. This time, she has created a multi-level work that places Freya and Frey in the front, their transportation to Midgard in the middle, and the sign of human celebration in the distance. The tiny cat pulling the cart is the best part! 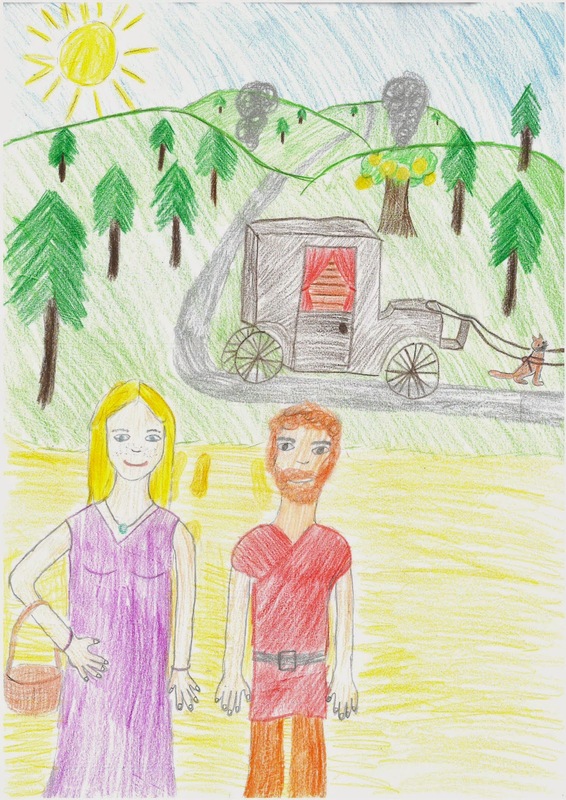 Third Place (Tie): Emma H.
Alyssa says, "In this sketch, I created a small, lighthearted festival among several elves. They've come to together to celebrate the announcement of midsummer as warmer weather surges delightfully throughout the beautiful and delicate forests where they dwell. Before taking to their feast, they decide to have a nice little bonfire to keep spirits high as the cool summer breeze flows throughout the trees." Alyssa's technical approach immediately stood out from the other entries. Her interesting usage of modern tools of art won her second place in the Midwinter 2013 contest. We're curious to see what she creates for the teenage division next year! London writes, "This is a painting of Sol carrying the sun across the sky and being chased by the wolf Sköll. The people are dancing around the bonfire to celebrate midsummer." London impressed all the judges with her sense of composition and her spirit. It will be very interesting to see how her work develops in the coming years! I love every one of them !! Beautiful job ! !